The electricity supply to Gaza’s 2 million residents has dropped to unprecedented lows, with blackouts lasting for more than 24 hours, the territory’s power distribution company said Thursday, prompting fears of a humanitarian and environmental crisis. The Palestinian enclave needs at least 400 megawatts of power a day, but only 70 megawatts were available as of late Wednesday, when Gaza’s power plant shut down after fuel shipments from Egypt were interrupted following a militant attack last week. The coastal strip had been experiencing the worst electricity shortage in years, limiting Gazans to about four hours of electricity per day. Israel's electricity power plant in Ashkelon on the Israel Gaza Border, June 19, 2017. Israel's national electric company Monday cut back its already limited electricity shipments to the Gaza Strip. The company confirmed that the Israeli government instruction. Palestinian President Mahmoud Abbas recently asked Israel, the main provider of power to Gaza, to cut shipments as a way of pressuring the Islamic militant group Hamas, which seized power in Gaza a decade ago. Several neighborhoods were without electricity for more than 24 hours Thursday. Late Thursday, Hamas said 27 Egyptian trucks with 1.5 million liters of diesel entered Gaza for the power plant. It was unclear when operations would resume. Diesel fuel from neighboring Egypt had kept the station running at half capacity since June 21, but deliveries were interrupted after a deadly attack on Egyptian soldiers last week near the border. 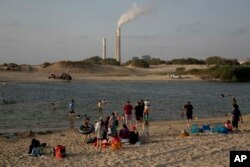 Gaza’s power station has low storage capacity, and requires new fuel shipments on an almost daily basis. Abbas has tried to squeeze Hamas financially in recent months, hoping to force it to cede power. He slashed salaries of his employees there, stopped payments for ex-prisoners and reinstated heavy taxes on the power plant’s fuel. Palestinians have been split since 2007, with Hamas ruling Gaza and Abbas governing parts of the West Bank. Repeated reconciliation attempts have failed. The Egyptian diesel shipments were facilitated by Mohammed Dahlan, a former leading figure in Abbas’ Fatah movement who fell out with the Palestinian president in 2010, went into exile and has since forged strong ties with the United Arab Emirates and Egypt.